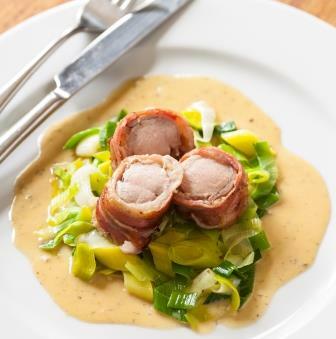 Rabbit and mustard sauce with buttered leeks. Wild rabbit is very tasty and low in fat. Like chicken but more flavoursome and darker in colour. Arrange the rabbit loins on the bacon rashers and smear with mashed potato. Roll up into a sausage shape using mashed potato as a paste to keep the roll together. Smear the rolled rabbit with whole grain mustard. Grease a sheet of kitchen foil with a little vegetable oil and scatter it with thyme leaves and sliced garlic. Place the rolled rabbit on the foil and fold over the foil into the shape of a Christmas cracker. Lift the ends of the‘cracker’ to use as handles. Place the sliced leek in a pan with the butter and add enough water to cover the base of the pan and come halfway up the leek. Add salt and pepper and bring to the boil before turning down the heat and covering the pan. Once the water has evaporated - this takes about 10 minutes - turn up the heat again and finish the leeks in the melted butter for two to three minutes. Season to taste. Finally, mix the mustard sauce ingredients in a small pan and stir well while heating through.